Where is the love? asked Roberta Flack and Donny Hathaway back in 1972 (and The Black-Eyed Peas in 2009). It’s really a complaint — you offered me love but it never came. Where can you find love, happiness, anger, grief? It’s only a slightly different question: Where do emotions happen anyway? Here are some candidates. Brain of the Artist, by Angela Palmer (2012). 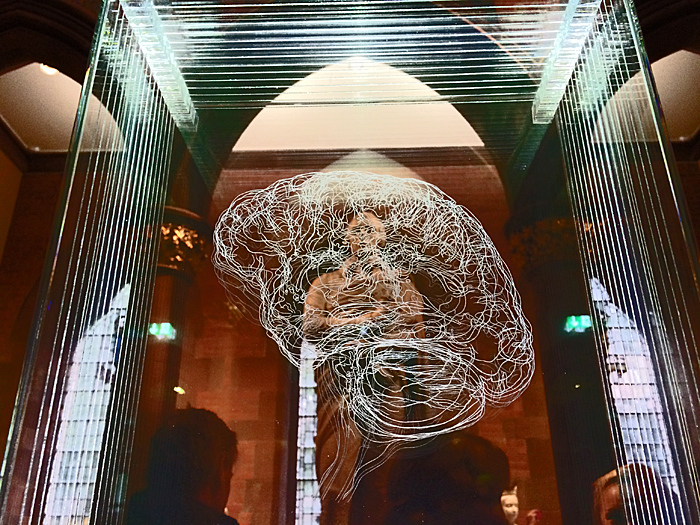 MRI scan of the artist’s brain mapped onto sheets of glass and on display in the foyer of the National Portrait Gallery, Edinburgh. The statue behind is of Walter Scott. 1. It’s in our heads. The limbic system, particularly at its core in the almond-shaped structure in the brain is known as the amygdala. According to A Beginner’s Guide to the brain, “it has a crucial and important role in the mediation and control of major emotions like friendship, love, rage and aggression; emotions that are essential for self-preservation” (68-69). Most popular books explaining “the new science of the brain” resort at some stage to diagrams of where things happen. The main purpose is to show the evolution of brain function, the functions that are the most primitive and shared amongst species (e.g. the fear response) to higher functions such as advanced problem solving. The proximity between functioning parts also provides clues about their mutual dependencies. For example, someone who has a damaged amygdala may recognise another person but won’t be able to decide whether or not they like them. 2. It’s in the whole body. The philosopher William James famously conflated bodily actions and basic human emotions such as fear. The stimulus encounter (a wild bear), running away, and the attendant feelings are what constitutes the emotion of fear. An emotion indicates an attitude after all, which is something the body does. As well as suggesting a mental view or opinion, “attitude” suggests a bodily posture, pose, disposition or orientation. To have an attitude to something is simply to orient one’s body in relation to it, often to face it. A person or thing can have “an attitude,” or simply “attitude” in its own right. A person “with attitude” is opinionated in a way that is unselfconscious. Attitude also relates to cool. Attitude connotes impudence and audacity, presented in a way that is calm, relaxed, unexaggerated, undemonstrative and self possessed. 3. It’s also out there. This is the extended mind proposition — that the mind is not only in the brain, the head and the human body, but that human beings are already wired in to the world as an extended, thinking entity. The human organism is very economical with its cognitive activity and in order to resolve problems latches onto aspects of the world to which it is already in tune. This is the compelling hypothesis of Andy Clark and David Chalmers. If thought is out there then presumably so are emotions. 4. It’s relational. Experimental psychologist Joseph de Rivera and colleagues have demonstrated that “an emotion may be viewed as a relationship between the person and other rather than as something within the person. … an emotion is not an internal response to an external situation but a transaction between person and situation” (366). (As implied in Where is the love? it’s all about relationships) I guess that you can angry at the bank teller at the same time you love your kids. There are obvious relational emotions, such as anger, horror and love. De Rivera argues that “me” emotions exist, such as depression, guilt, and a sense of security. But here there’s an implicit other. That seems to me like the way some scholars characterise thought, as talking to yourself. Talking to yourself “internally” is a practice derived from conversation with others. What we characterise as “internal processes” derive from something relational and grounded in social interaction. 5. It’s in the environment, including architecture and equipment. Here I’ll re-quote the philosopher Otto Bollnow (from a previous post on dance): “Mood is itself not something subjectively ‘in’ an individual and not something objective that could be found ‘outside’ in his surroundings, but it concerns the individual in his still undivided unity with his surroundings. … One speaks of a mood of the human temperament as well as of the mood of a landscape or a closed interior space, and both are, strictly speaking, only two aspects of the same phenomenon” (217). I’m currently exploring how digital devices are complicit in forming emotions, particularly moods. See Life changing technologies and Mood machines. 6. It’s in language. There are different ways of talking about emotion. Certain words are encouraged and acceptable in some contexts but not others. Anthropologist Catherine Lutz observed practices different to her own (European-American) associated with grief and crying. In her fieldwork into community life in a Micronesian island she was exhorted by locals at a funeral to “cry big” rather than just sniffle. If she didn’t cry big she “will be sick” (100). Emotions get circulated, validated, and even created through a host of linguistic practices, metaphors and tropes (as in a love song). 7. It’s ontological, i.e it pertains to our being. This is a Phenomenological position, more accurately directed to moods. Emotions draw on our immersion in a primordial condition of Stimmung. I don’t think it’s sufficient to say “all of the above.” There are ideological differences, differences in emphasis, and different disciplinary, social and political processes in play. Another old hit says “Love is where you find it” (The Whispers, 1981). Is that enough? But once we get it out of our heads that it’s just in our heads, there’s some accord. de Rivera, Joseph, and Carmen Grinkis. 1986. Emotion as social relationships. Motivation and Emotion, (10) 4, 351-369.